When I was a little boy, I wasn’t taught that my body was mine and that it mattered what happened to it. When a predator touched me and raped me, I had no idea that those were things he shouldn’t be doing. I assumed he had a right to do whatever he wanted to me because I believed I had no rights to anything, including my own body. I celebrate my birthday this week, and what I would love more than anything is for you to give the children in your life the gift I never received: talk to them about sexual abuse! 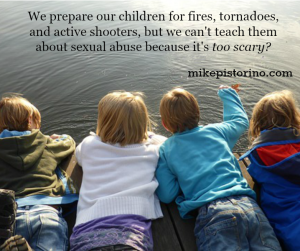 You may think that the children in your life are not as vulnerable to sexual abuse as I was. While it’s true that I was the perfect target, the reality is that all children are vulnerable because predators are masterful at manipulating children and adults. The majority of predators are not on any list because they’re exceptionally good at what they do. A lot of adults are afraid to talk about sexual abuse with the kids in their lives, and often when they do, it’s approached like “the talk” – a one-time, serious, awkward and often hushed lecture that disrupts the normal routine. With this kind of approach, kids receive the information as something out of the ordinary that’s only to be heard and talked about on this one occasion. Instead, it should be weaved into discussions you have with your children every day in the same way that school projects or sports schedules are talked about. If we’re afraid to talk about sexual abuse with our children, they’ll be afraid to talk about it with us! 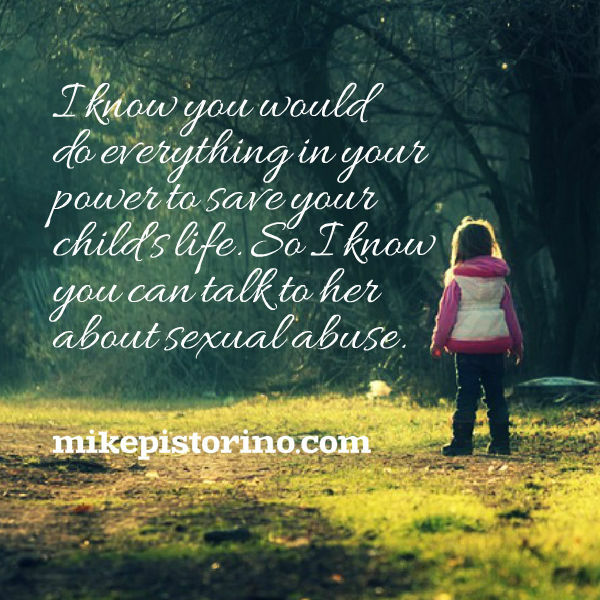 Talking to your kids about sexual abuse is not about painting a picture that there are bad people in the world that should be avoided. Most kids can’t avoid adults who would sexually abuse them, since most of those adults are people kids frequently interact with and depend on, and these adults are certainly not considered “bad” by kids. It’s about empowering children to have greater awareness and assertiveness when it comes to their bodies and what happens to them. Children can’t prevent sexual abuse, but we can arm them with the tools to recognize it and the confidence to tell us about it if they experience anything that is or could be abusive. 1.) Children deserve to know and to speak without shame the correct names for all their body parts. 2.) Children have the right to decide for themselves what happens to any part of their body at any time. If a child wants tickling to stop, it should stop. If a child doesn’t want to hug a relative, he shouldn’t have to. The bodies and boundaries of children deserve to be respected by everyone, always. 3.) No one ever has a right to look at or touch the private body parts of a child in any way, nor should a child be made to look at our touch the private body parts of anyone else. If it happens, or if the child thinks it might have happened, they can tell us about it. We will not be mad at them and they will not get in trouble. 4.) It’s always okay for a child to speak up, to be heard, and to say “no” to anyone about anything. A lot of children have suffered abuse in silence because they were taught manners are the most important thing. They are not. A child’s health and safety are the most important things. 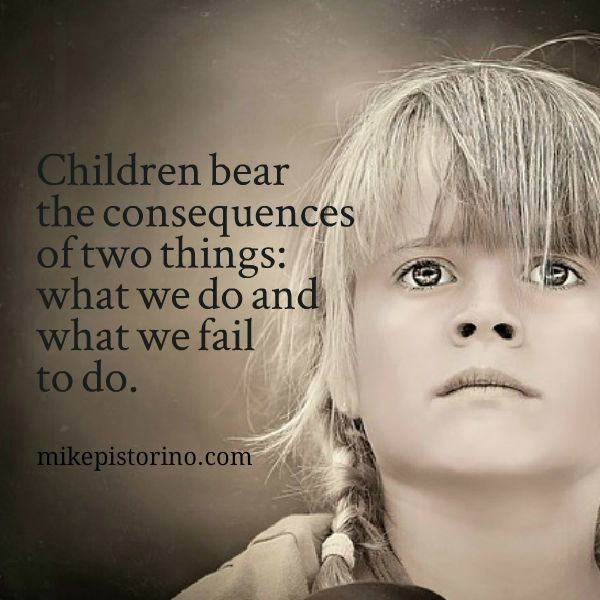 Empowering your children is not a precaution. It’s an act of love that will positively influence many aspects of their lives, and it just might save their life. It is a precious gift all children deserve to receive. For my birthday, please talk to your children about sexual abuse. It would be the greatest the gift I never received.